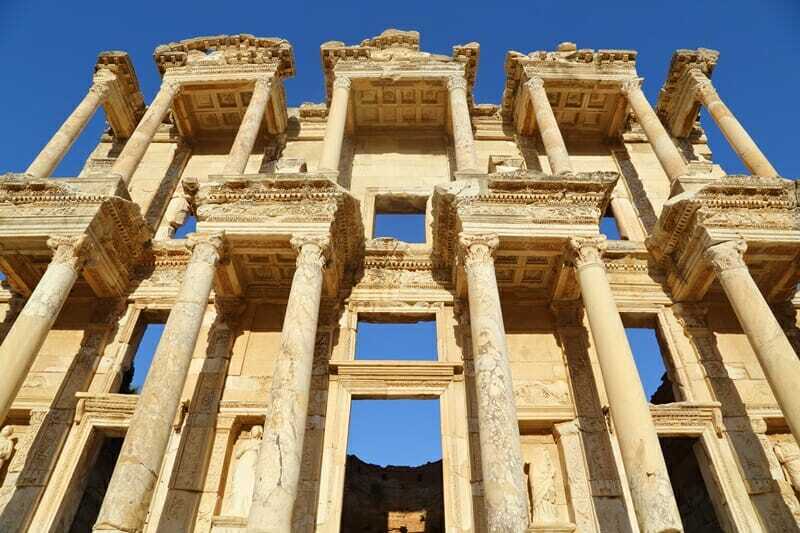 The ancient Greek (and later, Roman) city of Ephesus in Turkey is home to some of the most wondrous ruins in the world including the Library of Celsus and the Great Theatre. Its location by the harbour meant that it was an important port city and a hub for trade and commerce. 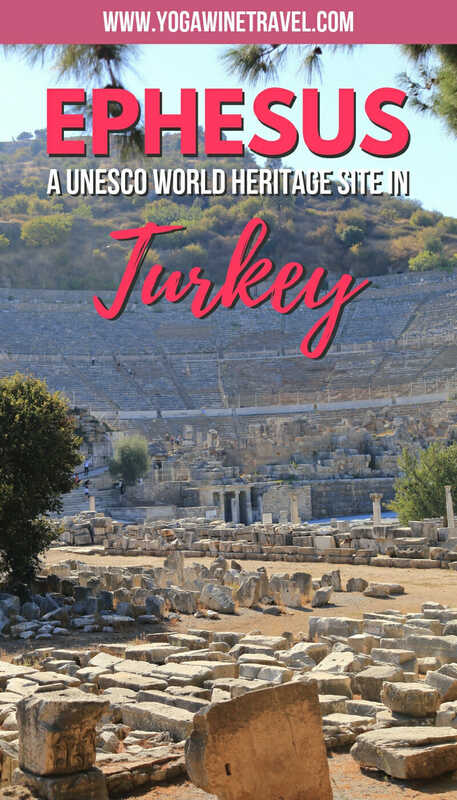 Ephesus became a UNESCO World Heritage Site in 2015 as “an exceptional testimony to the cultural traditions of the Hellenistic, Roman Imperial and early Christian periods as reflected in the monuments in the centre of the Ancient City and Ayasuluk. The cultural traditions of the Roman Imperial period are reflected in the outstanding representative buildings of the city centre including the Celsus Library, Hadrian’s Temple, the Serapeion and Terrace House 2, with its wall paintings, mosaics and marble panelling showing the style of living of the upper levels of society at that time.” All just a fancy way of saying that it is an incredibly well-preserved landmark showcasing the unique architecture and design elements of an ancient city. 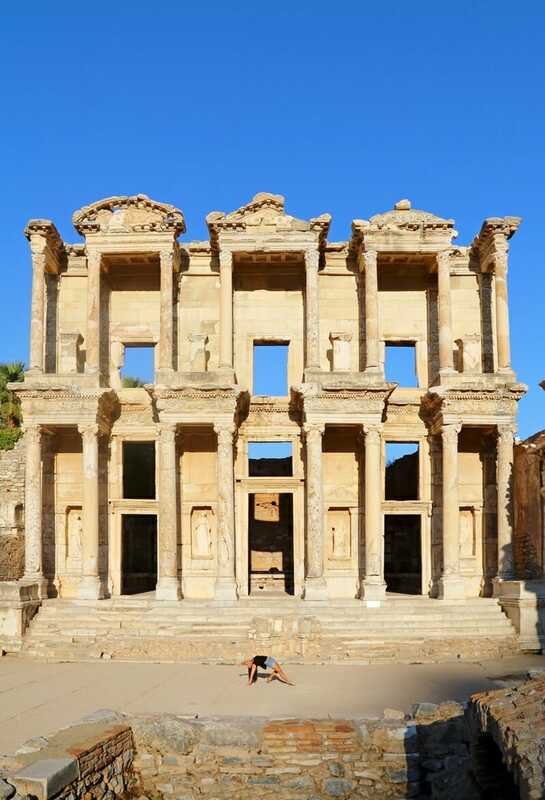 Today, the ancient city of Ephesus is one of the most popular tourist attractions in Turkey and a must-visit landmark to add to your Turkey itinerary. 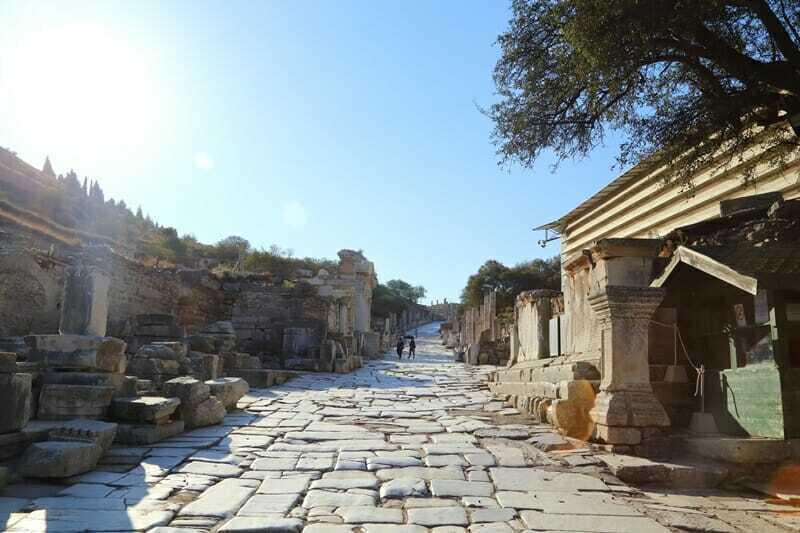 Want to explore Ephesus in 1 day? 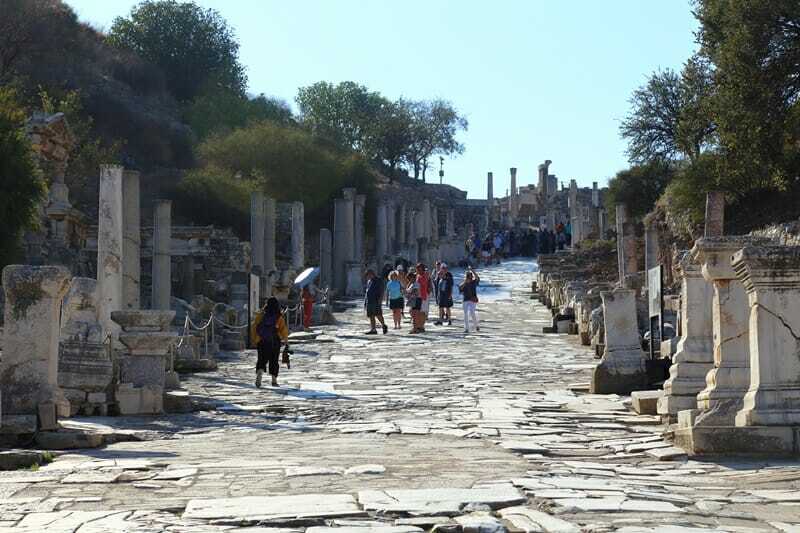 Read on for what to see in Ephesus, how to get around and where to stay! Izmir to Ephesus: Present day Ephesus is located in Selçuk, a city 1 hour away by car from Izmir. The easiest way to get to Ephesus is by flying into Izmir Adnan Menderes Airport (airport code: ADB) and renting a car to drive to Selcuk. We rented a Hyundai i20 car from Alamo and they were extremely helpful – it cost us only US$110 for 8 days and tolls are virtually non-existent in Turkey. Alaçatı to Ephesus: Alaçatı is a small seaside town about 45 minutes away from Izmir, or 2 hours away from Ephesus. It is an extremely cool and sophisticated town, and offers a plethora of boutique hotels and trendy restaurants. 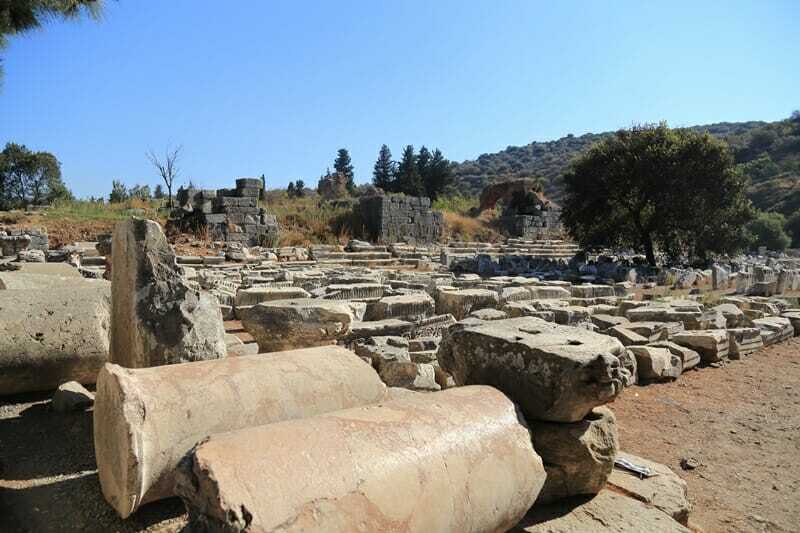 If you don’t want to stay in Selcuk or Izmir then Alaçatı is another option – a day trip from Alaçatı to Ephesus can easily be done if you have access to a rental car. Looking for the best prices for rental cars around the world? Click here to book your rental car ahead of your trip. Bookings can be cancelled or amended if your plans change! Istanbul to Ephesus: There are plenty of direct flights each day from Istanbul to Izmir or Cappadocia to Izmir during the peak season (June to September). During the shoulder or off-peak seasons you can simply stopover in Istanbul if you are traveling from Cappadocia to Izmir. It’s not possible to do a day trip to Ephesus from Istanbul, the drive alone would take you nearly 14 hours both ways. I recommend either 1 night in Selcuk or 1 night in Izmir – you don’t need more than 1 full day and night in Selcuk as there isn’t a ton to see and do beyond the ancient ruins and archaeological museum. Visiting Izmir? You might also want to head to Pamukkale, Turkey’s “cotton castle”. Head on over here to read more about how to visit Pamukkale and what to be aware of before your trip. The currency is the Turkish Lira or TL and the exchange rate is approximately US$1: 5-6 TL. There are also very few places in town to buy a local Turkish SIM card. We actually didn’t end up purchasing one because there was no shop at Izmir Airport that sold them. Instead, we downloaded maps via airport wifi for offline use. Read more on how to do that here. The Museum Pass Aegean is a great card to purchase if you are staying in the region for a few days. 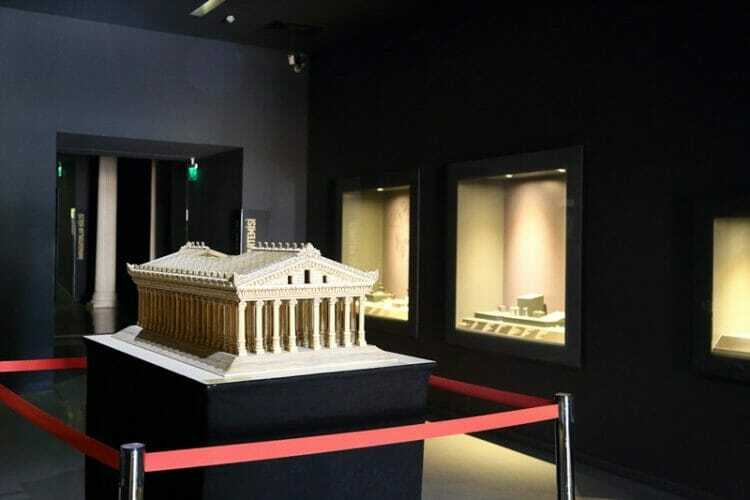 It is accepted at Ephesus Archaeological Site, Ephesus Museum, St. Jean Monument, Akropol Ruins, Asklepion Ruins, Bazilika Ruins, Bergama Museum, Agora Ruins, Çeşme Museum, İzmir History and Art Museum, İzmir Archeology Museum, Klaros Ruins, Aphrodisias Ruins, Didim Ruins, Miletus Ruins, Milet’s Museum, Aydin Museum, Priene Ruins, Bodrum Underwater Archeology Museum, Mausoleion Ruins, Zeki Muren Art House, Beçin Castle and Ruins, Marmaris Museum, Sedir Island, Knidos Ruins, Kaunos Ruins, Kayaköy Ruins, Tlos Archaeological Site, Letoon Ruins and Xanthos Ruins. The pass can be purchased at any of the sites listed above that accept it. 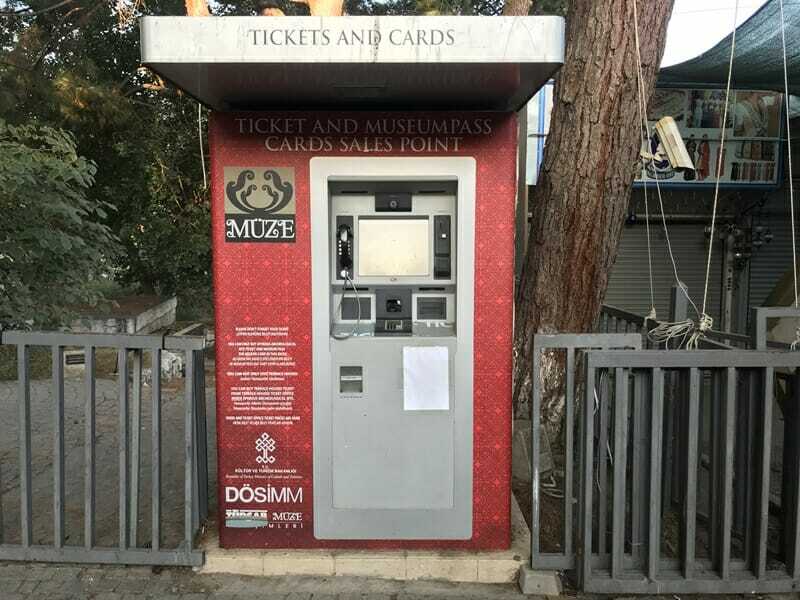 If you are traveling to other places in Turkey including Istanbul, Cappadocia or Fethiye, you might want to purchase the Museum Pass Turkey for 315 TL instead. The Museum Pass allows you to skip-the-queue and simply scan the bar code to enter through the turnstiles. The best time to visit Ephesus: We visited in September, and while it wasn’t the peak season you can still expect a steady flow of tourists, though the crowds in Turkey are nowhere near as smothering as in Greece or Italy. The weather is milder than in the summer months so the days are hot, but mornings and evenings can be slightly cooler. June to August is the peak season in Turkey so it can get crowded, and it can get bitterly cold during the winter months from November to late February. I recommend visiting Ephesus in spring from March to June, or autumn from September to November. What to bring: There isn’t much shade at the Ephesus Archaeological Site, so bring sunscreen, a hat and a bottle of water. There aren’t bathrooms within the archaeological site but you can use the toilets outside the ruins or at the museum. You might also want to bring some cash for parking at the museum and/or snacks and fresh juice (pomegranate juice in Turkey is the bomb). Click here for more Turkey travel tips and guides or you can read more on travel mistakes to avoid making in Turkey here! If you’re staying overnight in Selcuk, I recommend Akanthus Hotel Ephesus, just minutes away from the ancient ruins. 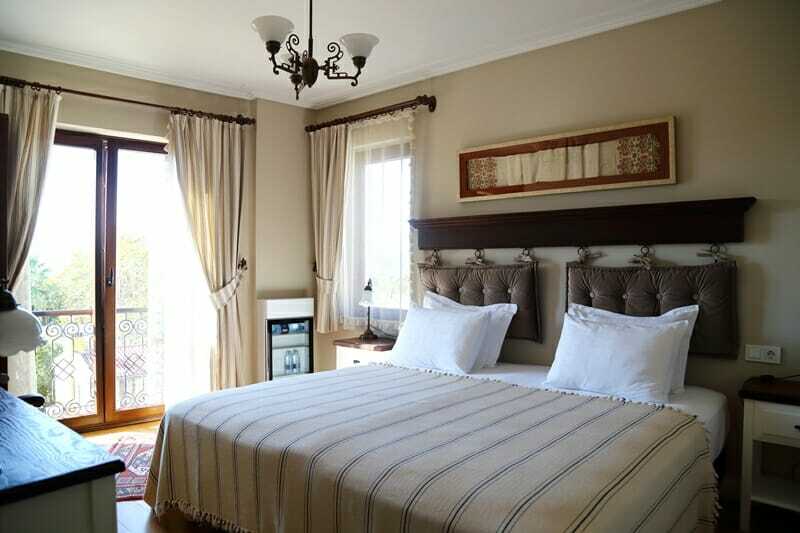 It is a beautiful and cosy boutique hotel with elegant, country chic decor. The owner is incredibly welcoming and the staff are very helpful and warm. The rooms are spacious and the wifi was fantastic, and don’t get me started on the amazing breakfast spread – lots of fresh produce, great coffee and the best scrambled eggs. I can’t recommend Akanthus enough – it looks even better than the photos if that’s possible! The hotel also has a pool for those extra warm days and free street parking outside. 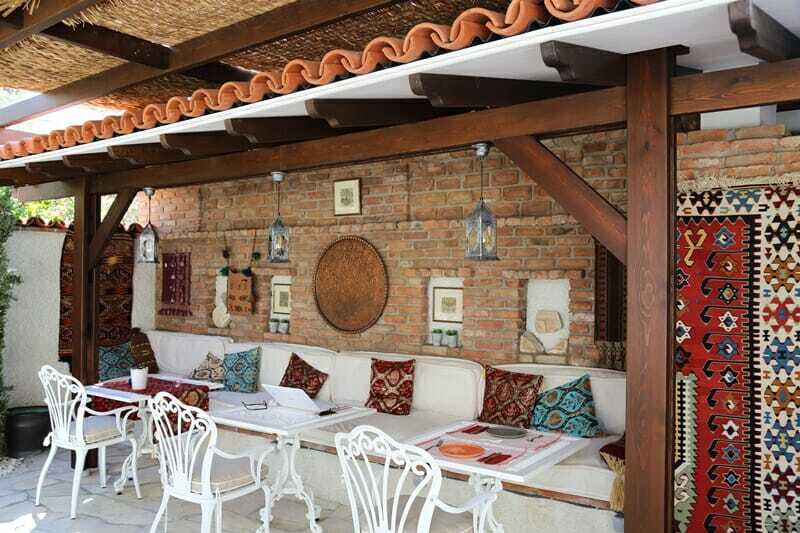 Click here to check current rates at Akanthus Hotel Ephesus or click here to see other highly rated options in Selcuk. Prefer to stay overnight in Izmir instead? Here are some popular hotels in Izmir. 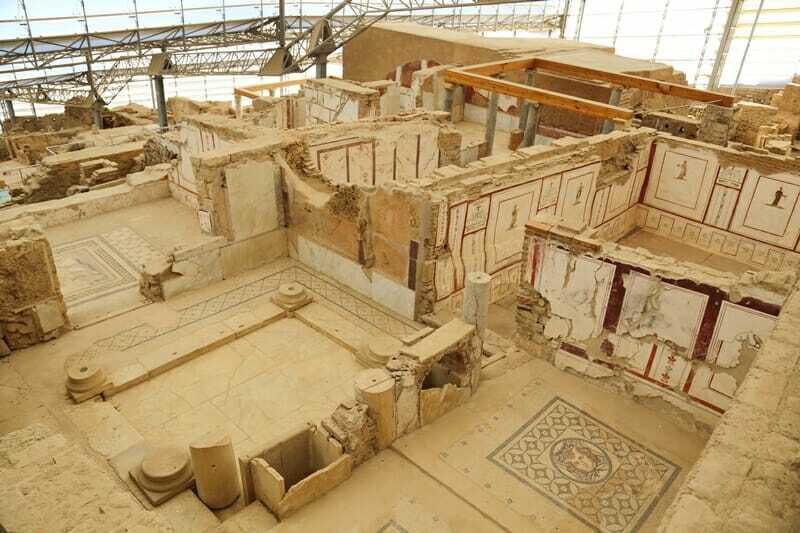 The Ephesus ruins has seasonal operating hours: open at 8 AM and close at 7 PM from April 15th to October 2nd or 5:30 PM from October 3rd to April 14th. We arrived at 8 AM in September and we were the only people at the Library of Celsus for a good 30-40 minutes. The large tour groups tend to arrive around 9 AM, so I recommend getting an early start! There are two entrances to the ruins – the North Gate, which is the lower gate (“Hercules Gate” on Google Maps), or the South Gate, which is the upper gate. Many people recommend taking the upper south gate as you can walk downhill, but this is the entrance that most of the big tour groups take, and the “uphill” walk is extremely mellow. It’s more like a gentle slope. I recommend going to the lower north gate as there is plenty of parking. Tickets for the Ephesus Archaeological Site cost 60 TL per person, and entrance into the Terrace Houses costs an extra 20 TL. Alternatively, simply use your Museum Pass (Aegean or Turkey) to skip-the-line and enter through the turnstiles. Once you enter through the lower gate, head straight to the Library of Celsus (you can double back and see the rest later) before other people start arriving. 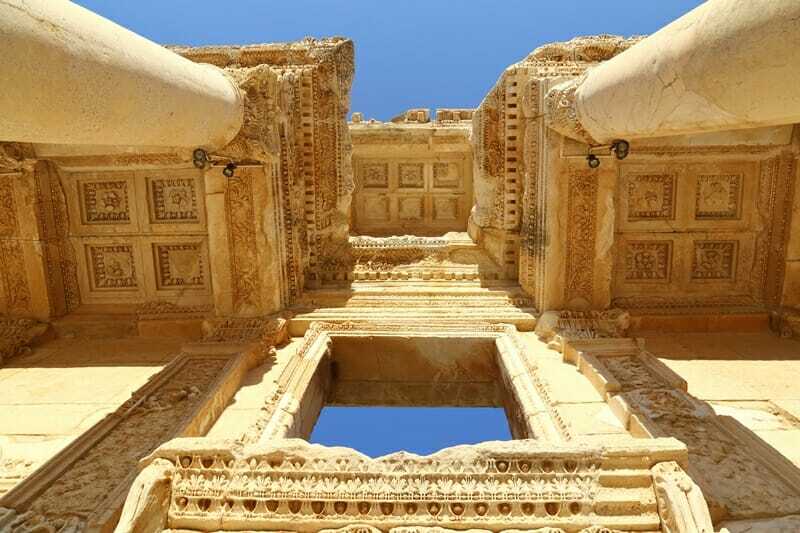 The towering Library of Celsus is an ancient Roman building built in 117 AD to honour Gaius Julius Celsus Polemaeanus, a Roman senator. 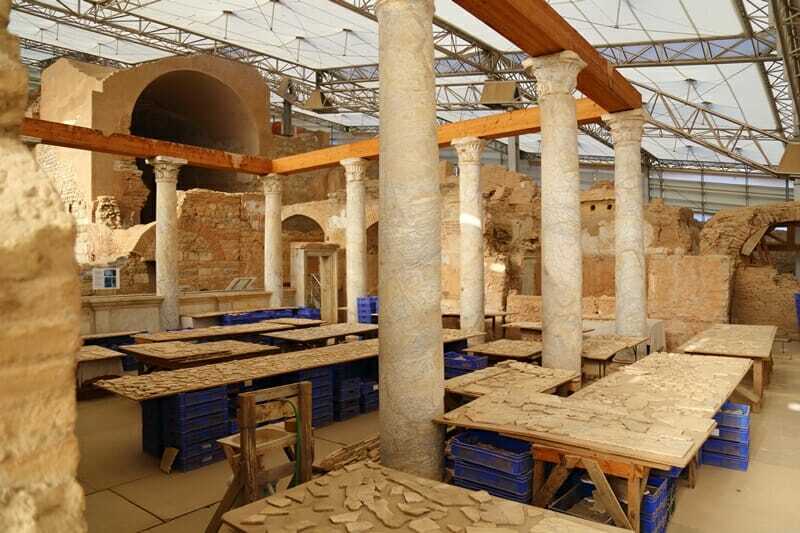 The library was built to store 12,000 scrolls and was one of the largest libraries in ancient times. The library sustained significant damage from earthquakes and fires, and only the facade remains following repairs by archaeologists in the 1970s. It is every bit as amazing as it looks in photos, and I recommend walking under the columns to view the intricate carvings and designs. Next, head up to the Terrace Houses, cascading residential houses with beautifully preserved and restored murals and frescoes. There, you can see the painstaking work that archaeologists have done to put broken mosaic tiles back together. Stop at Hadrian’s Gate and the Temple of Hadrian, a temple with beautiful columns and a striking stone arch, before making your way up to the Odeon, a small theatre that could hold 1500 spectators. 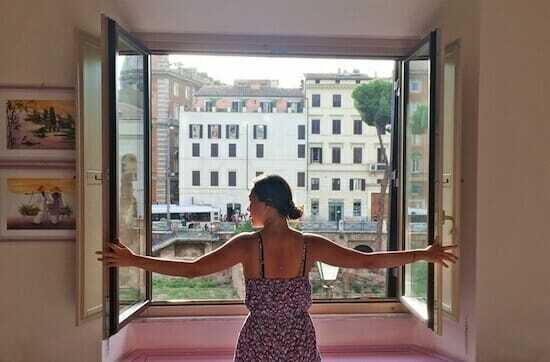 Double back and stop quickly at the Brothel before heading to the massive Antique Theatre. Once capable of holding 25,000 spectators, the amphitheatre is one of the most spectacular structures in ancient Ephesus. 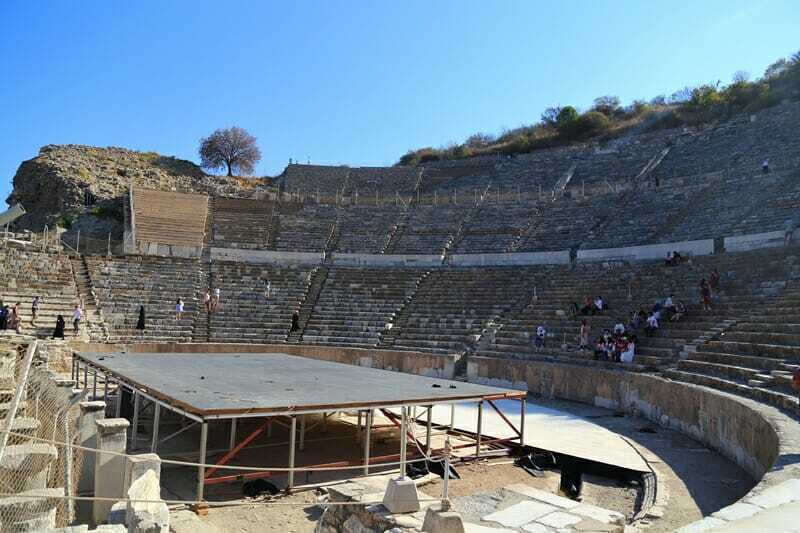 The theatre was used for performances as well as meetings and gladiator fights. Finally, check out the Theatre Gymnasium which was used to training and bathing. 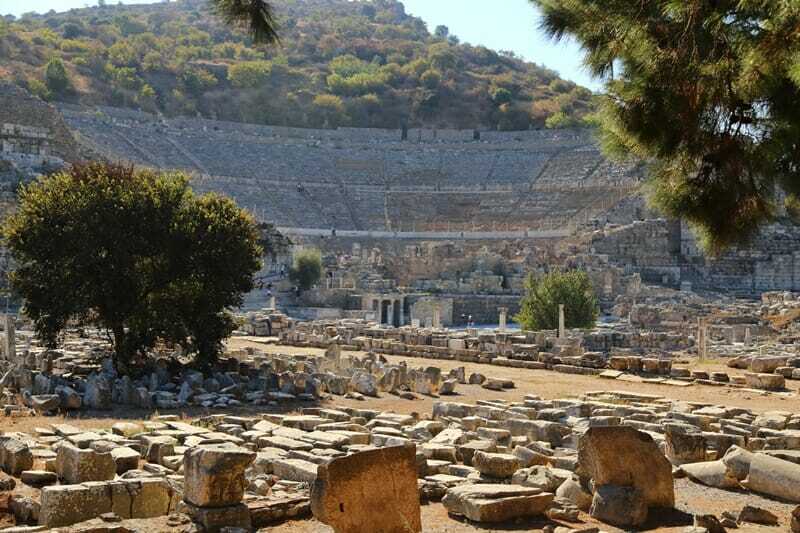 You should plan to spend 90 minutes to 2 hours at the ancient Ephesus ruins. 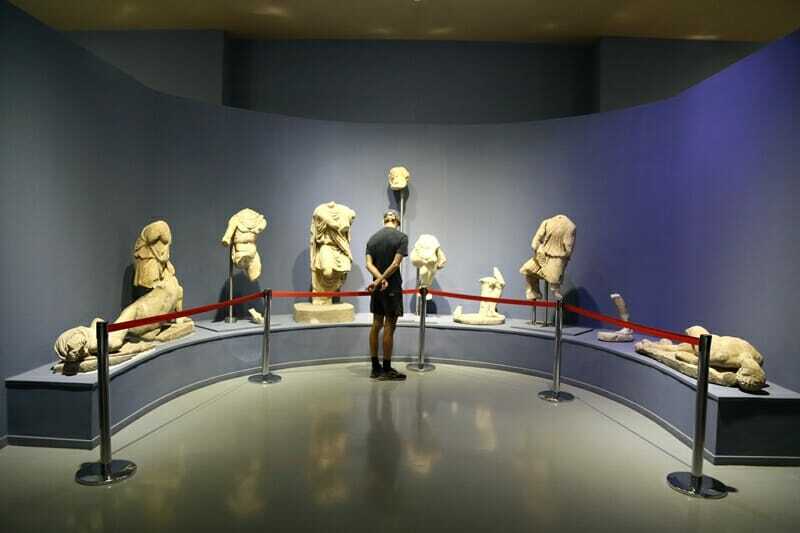 Make sure you also visit the Ephesus Archaeological Museum, 5 minutes by car from the ruins. The museum houses an impressive collection of artifacts excavated from the ruins after 1923. Unfortunately, the treasures excavated prior to this were transported to London and Vienna. 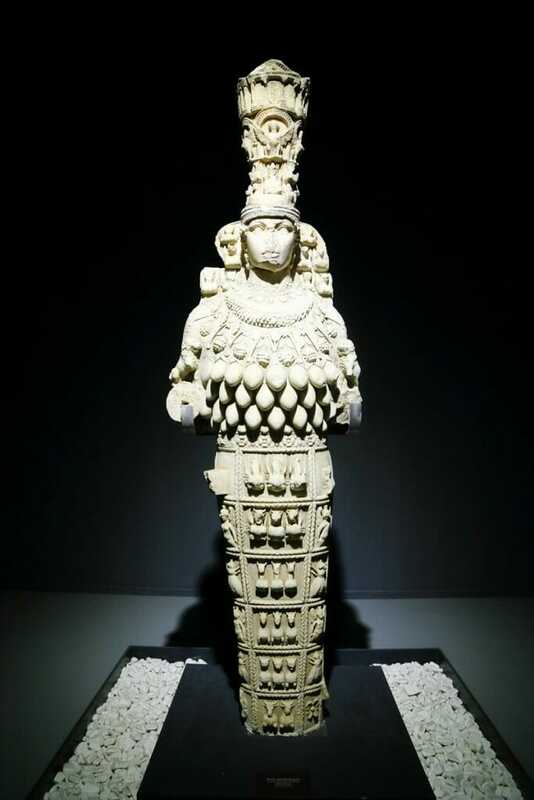 Don’t miss the unique statues of Cybele and the finds from the Temple of Artemis. 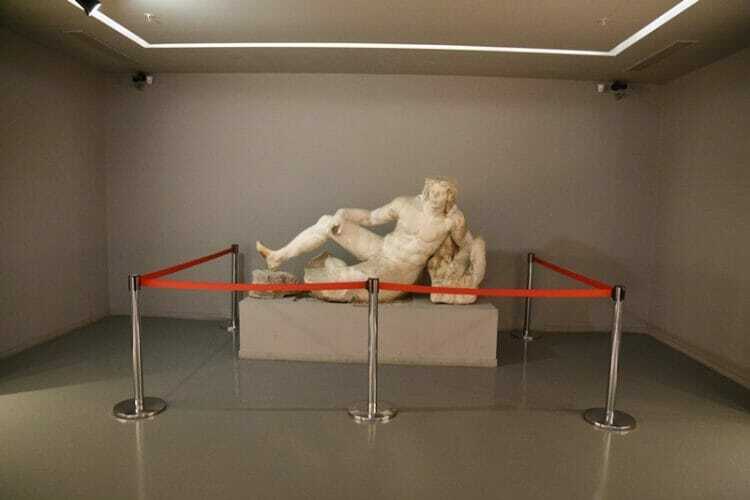 Entry costs 15 TL and is covered by your Museum Pass. You will also be charged around 10 TL for parking (cash only). 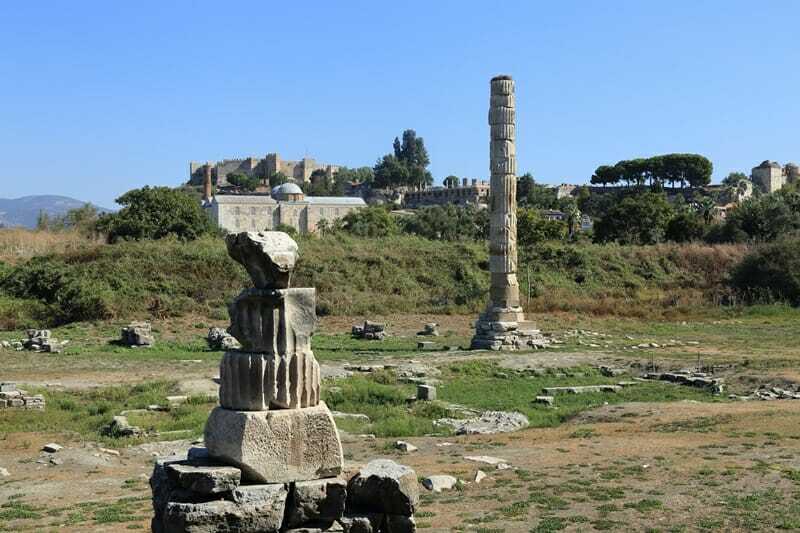 The Temple of Artemis is a stone’s throw from the museum, and was one of the Seven Wonders of the Ancient World. The temple was completed around 550 BC but little survived after it was demolished by fires and earthquakes – one lone column remains standing. There is no entry fee for the Temple of Artemis. 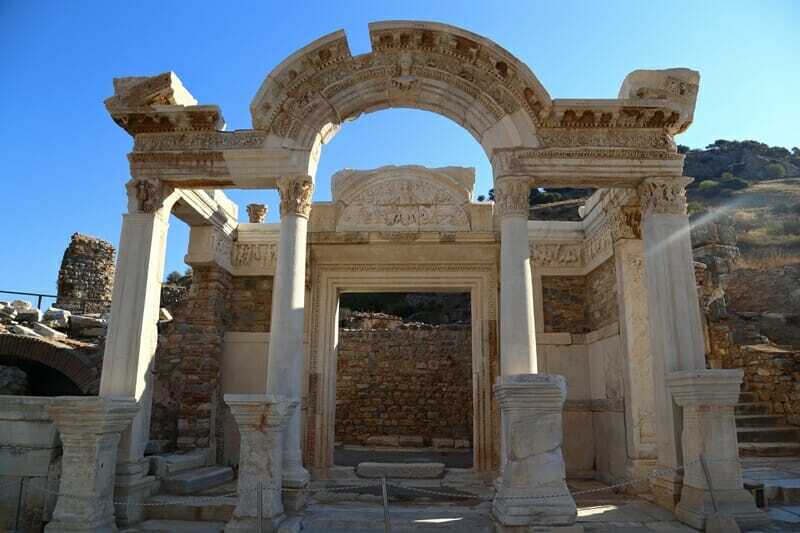 These are the main attractions in Ephesus/Selcuk, but if you have more time you might also want to visit the House of Virgin Mary and Basilica of St. John. Ephesus is an incredible, unmissable place to visit in Turkey, and the good news is that while there is a boatload to see, it can easily be seen in a few hours’ time. Ready to book your trip to Ephesus? Click here to check current rates at Akanthus Hotel Ephesus or click here to see other highly rated options in Selcuk. Prefer to stay overnight in Izmir instead? Here are some popular hotels in Izmir.